WARNING: This review will contain spoilers for Prometheus, and some articles that I link to will spoil both that film and Alien: Covenant. In 2104, the colonization ship Covenant heads to the distant planet Origi-6, bearing two thousand colonists in cryosleep as well as over a thousand human embryos. A sudden neutrino burst damages the ship, awakening the crew and resulting in a number of deaths. While conducting repairs, they pick up a transmission from a nearby, previously undetected planet, which appears to be better suited for colonization. The new captain, Christopher Oram (Billy Crudup), decides to investigate, against the objections of second-in-command Daniels (Katherine Waterston). They descend to the planet’s surface and explore, but it isn’t long before they discover that this is not the paradise they thought it was. Awaiting them include a biologically hostile environment as well as the synthetic David (Michael Fassbender), a survivor of the Prometheus mission from 10 years prior. 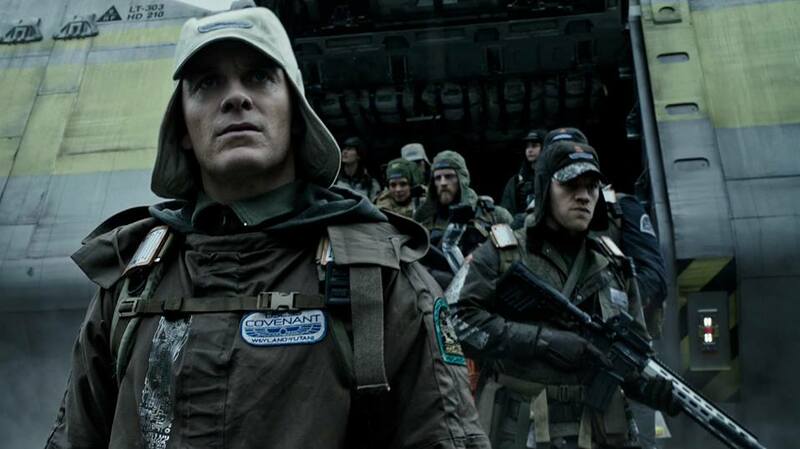 The biggest issue with Alien: Covenant is that it tries to be two movies: a Prometheus sequel and an Alien film. I know this sounds odd on paper considering that Prometheus is the prequel to Alien, but it becomes quite clear that Scott – returning to this universe for the third time – is attempting to merge two narratives here. He wants to continue the story that began with Prometheus, but he also wants to make this a film about the xenomorph. Needless to say, much like its ill-fated characters, this venture doesn’t turn out well, resulting in a shockingly predictable and muddled picture. Now, I think Prometheus is a solid film. I know it’s not everyone’s cup of tea, and while I can’t deny that it’s full of stupid moments, I can’t help but admire it for its vision and attempts to be its own film instead of a direct Alien prequel (in which we would know how it would end). Sure, it has the Alien DNA, but it operates at its best when it’s not building up to the original film and instead telling a captivating story about the contentious relationship between creators and creation. Admittedly, I had a lukewarm reception to it when I first saw it in theaters, but I’ve since warmed up to it, thanks in part to this engrossing and extensive analysis claiming that in this universe, Jesus Christ was an Engineer that humans crucified, which has since been confirmed. 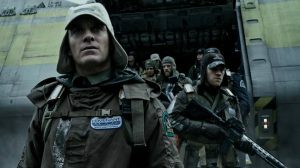 For me, Prometheus is a great film for the first hour or so before it falters due to dumb characters and a frustrating tendency to tease answers. Scott, who has addressed what he perceives as the shortcomings of Prometheus, treats that film almost like a red-headed stepchild in Alien: Covenant, as he wants to build off of that film while also shedding himself of it. David is obviously the character whom Scott, along with screenwriters John Logan and Dante Harper, wants to focus on. Indeed, the android is a compelling figure here, and his scenes – particularly when he’s paired with Walter (also played by Fassbender), a newer synthetic model from the Covenant – serve as the film’s highlight, as they continue to run with the theme of creators and creation. What doesn’t work as well is the idea of making David an allegory for Satan since it never feels earned, despite a prologue that lays the seeds for it. Furthermore, the film makes two outrageous storytelling choices (that I won’t spoil) which feel like a slap in the face to those who were invested in the story of Prometheus and wanted to see where it would go with subsequent films. In a way, this would be hilarious if it wasn’t so cruel – which makes the film’s nihilist undercurrent much more pronounced. Just as the film stumbles at being a decent follow-up to Prometheus, it also fails to be an interesting Alien film. It tries to capture the atmospheric dread of Alien, the action of Aliens, and the existential bleakness of Alien 3, and despite a few neat sequences, the film falls short in all three aspects. 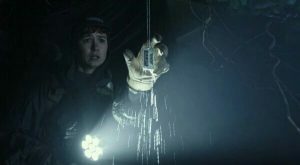 There’s honestly not much of an effective buildup to nor the atmosphere for the horror, and at times, it feels like a run-of-the-mill, B-level slasher movie with better production values. The action sorely misses the thrills and hardly feels inspired – perhaps most typified by a finale which is inspired by those from the first two Alien films, but definitely pales in comparison. Scott is content to shove the film’s bleakness down our throats right from the start such that it seems like we’re obligated to feel depressed. Then there’s the handling of the xenomorph itself, which proves to be quite disappointing because I think it negatively affects Alien. See, the allure of Prometheus was the opportunity to find out where the xenomorph and the Space Jockey from Alien came from. While that film provided some clues for the latter (the Space Jockey turned out to be an Engineer), it didn’t answer the former – which is fine because fans knew that’s what the sequels would eventually reach. Alien: Covenant throws out the Engineers and finally answers the question of the xenomorph’s origin, and frankly put, it’s completely unsatisfying and even goes so far to discombobulate the Alien lore. I think it says a lot when I say that I’m not at all excited to see where Scott goes from here with another Alien film (yes, he’s returning). The film is a failure when it comes to continuing a story and building a world, and what doesn’t help it at all is its host of thinly drawn and idiotic characters. Here’s the thing about the xenomorph: it’s not meant to be a main character, nor should it be the focus of the story. The xenomorph is there to accentuate the drama that comes out of the characters, both human and synthetic. Scott seems to understand this, but he fills the film with a lot of characters that are near-impossible to care about. Out of this fairly large cast, you only need to know six of them because everyone else is an expendable body with barely any backstory, whose sole purpose is to be chowed down on or ripped apart. Making this worse is that pretty much everyone makes exasperatingly senseless decisions that render our suspension of disbelief void, like going off alone when there’s a threat at large (and believe me, this is probably the least egregious out of all stupid actions taken). The cast members, bless their hearts, certainly do their best, with Fassbender, Waterston, Crudup, and Danny McBride being standouts. However, it’s a shame that most of them are handed characters that are neither memorable nor worth our empathy. There’s impressive craftsmanship to be found here, though not everything is up to snuff. Cinematographer Dariusz Wolski captures some striking images, and the use of handheld cameras for some of the scary sequences accentuate the panic felt by the characters. Chris Seagers’ production design beckons us into the world with the interiors of the Covenant and the sinister rooms that make up David’s lair. 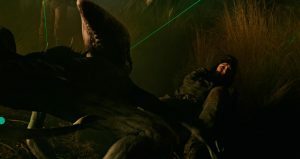 While editor Pietro Scalia handles cross-cutting with a sure hand, the pacing of the film does suffer a bit in the middle when David and Walter interact. The sound design is top notch, especially with that concerning the creatures. While it has its moments, Jed Kurzel’s score is at its best when it pays tribute to Jerry Goldsmith’s work on Alien. 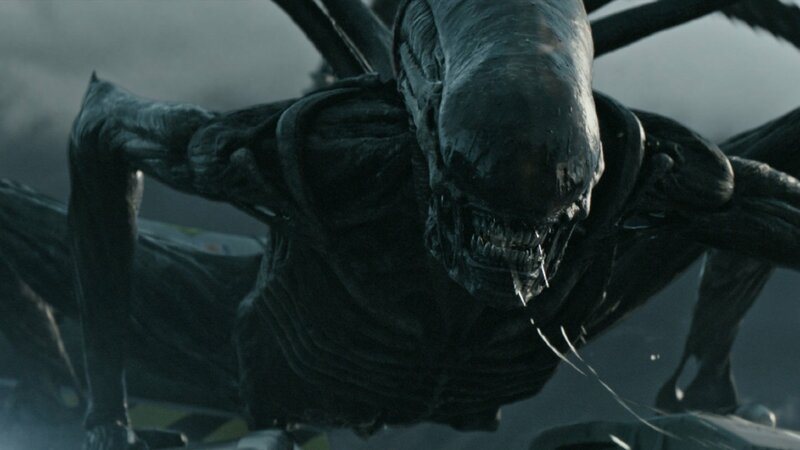 It must be said that this is a pretty gory movie, and such sequences would be worthy of praise if it weren’t for one thing, which is the xenomorph itself. 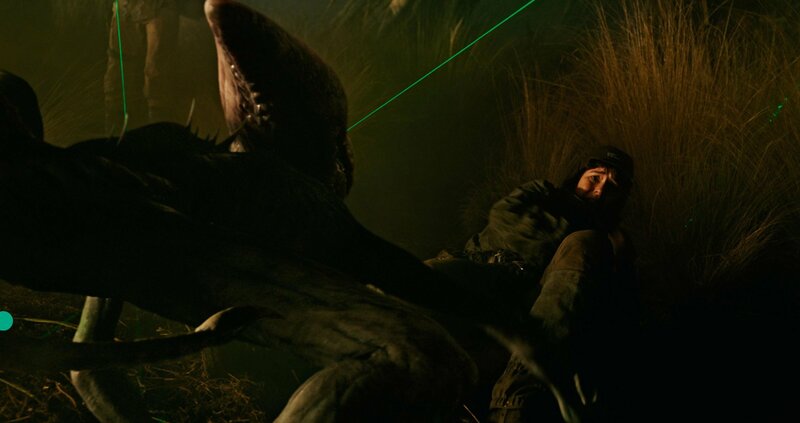 I’m sure some practical effects were used for the creature, but considering how fast and fluid its movements are, it seems like it is mostly realized through the use of CGI. While I normally wouldn’t mind this, it’s quite distracting because of how obvious it is, despite Scott’s attempts to shroud it in the shadows. 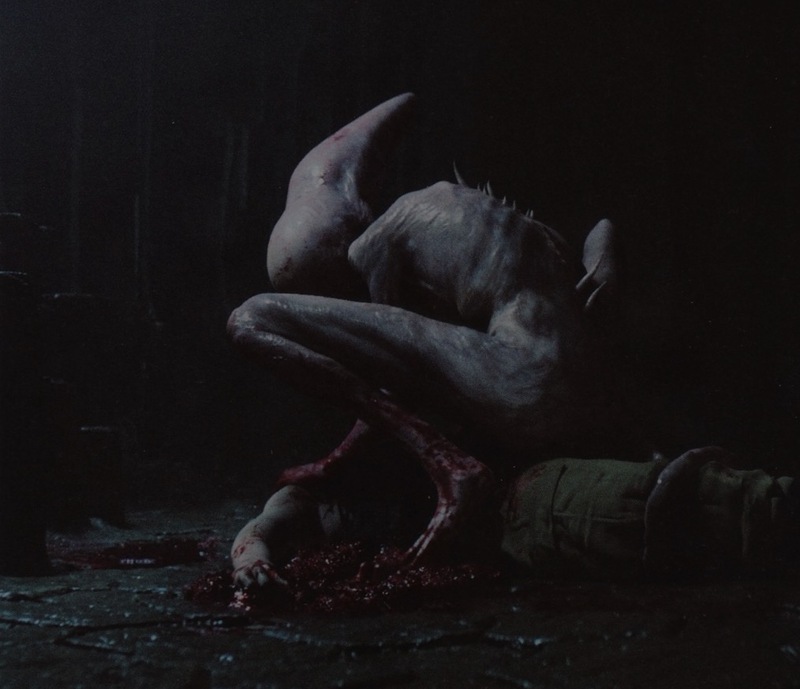 Alien: Covenant left me feeling ill, and it’s not because there’s a chestburster gestating in me (though I wish this was the case). No, I felt ill because I got the sense that I was hearing the death knell of a franchise I love, and what really hurts is that it was at Scott’s hand – the very filmmaker who gave us Alien and Prometheus. This probably won’t be the worst film of the year, but I’d be quite surprised if it doesn’t end up being the most disappointing for me.